About a month ago, before the fiftieth anniversary of Richard Feynman’s “Plenty of Room at the Bottom” talk, I re-read Ed Regis’s 1995 book Nano, still the only good narrative history of the origins of the idea of nanotechnology. 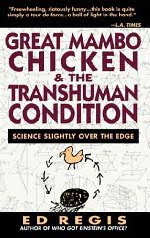 Yesterday, I read for the first time Regis’s previous book: Great Mambo Chicken and the Transhuman Condition, first published in 1990. Anyone interested in the history and sociology of today’s transhumanist movement should read it. Regis describes the network of futurists and activists whose ideas laid the groundwork for many of today’s strains of far-out futurism, with descriptions of Alcor and the old L5 Society, as well as profiles of Eric Drexler (of nanotechnology fame), Keith Henson (the impresario who co-founded L5 and was involved in many other projects), Jim Bennett (best known in political circles for writing about the Anglosphere, but deeply involved in the private-space movement), Ralph Merkle (cryonics and nanotech), Dave Criswell (dabbler in distant-future space speculations), Hans Moravec (known for robotics and posthumanism), Robert Ettinger (the father of cryonics), and many others. Regis, who describes himself as a “half-baked philosophy professor,” writes with a wit and verve that suggests the influence of Tom Wolfe — indeed, the book’s first chapter, describing rocketeer Bob Truax’s cooperation with Evel Knievel, could have appeared in the pages of The Right Stuff — and, like Wolfe, Regis is broadly sympathetic to his subjects even as he gently exposes their obsessions and foibles. He allows a few pages here and there for serious criticism of the futurists’ excesses, but not much. The digital organism enthusiasts certainly think they are talking about something of real substance. The most direct conclusion to draw is that they have simply reified in their minds a set of computations and data structures. Having calculated certain ideal relationships expressed in program logic, they allow these relationships to condense, specter-like, into dim, vaguely imagined physical objects—objects that are, as a result, gratifyingly well-behaved in a logical sense. They then herald these ghostly compactions of logic as powerful demonstrations of how actual physical organisms evolve in obedience to the now perfectly displayed logic of their evolution. There is something stunningly backward and tautological in all this. What these researchers are really doing is exploring certain possibilities of mathematical and algorithmic logic. It’s a legitimate thing to do. Throughout the history of science the elaboration of mathematical formulae has often led, at least in the physical sciences, to subsequent discovery of application for these formulae. But this doesn’t alter an obvious truth: the discovery always needs to be made, and it can be made only through observation of the world. Many of those who speak about artificial life seem strikingly casual about the role of observation. As always with Steve Talbott, the entire essay is well worth reading. So, too, is his subsequent exchange of letters with one of this field’s leading proponents. "Great Mambo Chicken" is great reading. I read it a couple of years ago and it brought back a gream many memories of my time in the late 80's SoCal scene (I was at the heart of everything the book talks about from that time). My only complaint about this book is that it was too serious and not enough humor. Before I read it, I was expecting it to be acomedy satire of the transhumanist movement much like "It Usually Begins with Ayn Rand" by Jerome Tucille is of the libertarians.